Welcome to the first stop aboard our Special Edition Loop. Join us as we throw a virtual baby shower for one of our members. First on our agenda are the invitations. For me the Invitation sets the mood for the celebration. It lets your guests know the theme of the shower and is your opportunity to make special requests. 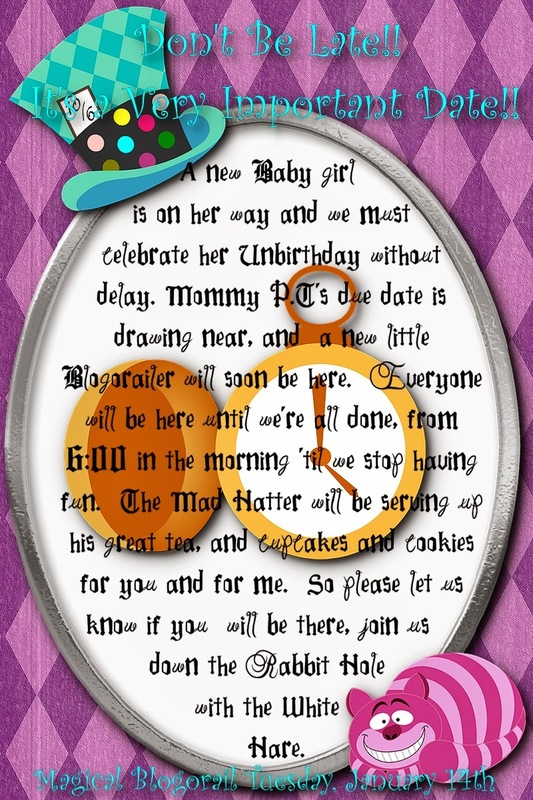 You could ask your guest to come dressed in their favorite hat or ask them to bring a present for the Alice In Wonderland themed nursery. I designed these using the Alice in Wonderland Clip Art Set from the 1EverythingNice Etsy store. Next we need to decorate for the shower. Personally, Alice In Wonderland makes me thing of color - and lots of it. I chose to go with bright whimsical decorations for the shower, it's virtually impossible not to have a great time in our Wonderland. Table setting - There are so many things I love about this table setting from Kristina Rice Photography. The colors are perfect, I especially like the color blocking of the tablecloths, it's very unique. The mismatched dinnerware and glassware with a different color napkin at each setting is perfect and the idea can easily be replicated. The table decorations placed on a grass square is great and I love the over sized Queen of Hearts card with the other cards spread about on the table. Tea Cup Centerpiece - This teacup centerpiece from Edie's Chic Crafts Etsy store screams Alice to me. The mismatched and brightly colored cups are decorated with butterflies, flowers and even the White Rabbit's pocket watch. Tulle Alice Table skirt - I love this table skirt from Sweets Indeed that was inspired by Alice's dress. I have made this myself and it is an easy DIY, just remember it will take A LOT of tulle, and it is definitely a make ahead project, It took me a few days to complete but it was worth the effort. Photo Props - Photo props are the new "must-have" for your party. Guests have lots of fun hamming it up for the camera, and you have lots of fun photos to make a photo book or scrapbook for the mother-to-be. These props from The Grape Vine Events Etsy shop are so bright and whimsical, definitely perfect for our party. Simply Mad Hats - These hats are actually ones I made for Ashley's Mad Hatter Tea Party Baby Shower when she was pregnant with Tripp. I was very pleased with how they turned out, I still have them in my craft room.You can find a tutorial here. Whimsical Food Labels - I created these cute food labels using the same Alice in Wonderland Clip Art to match the invitation. The font is LD Madhatter. Fun Cupcake Toppers - Using the Alice in Wonderland Clip Art Set and Fotofusion I created these adorable cupcake toppers. They are a quick and inexpensive way to add a little extra to the food table. Framed Alice Quotes - I love creating quotes with cute backgrounds and clip art and putting them in decorative frames throughout the room. You can have them printed at Walmart and put them in 4x6 or 5x7 frames. You can paint old frames bright colors to match the theme, if you are like me you have lots of craft paints around or you can always spray paint them. Thank you Tricia! I love doing this, can't wait to host my next Disney party. Love the invitation! It's so creative! Wow! What wonderful ideas you always come up with, Donna Kay! I want to come to a party at YOUR house! I wish you were closer, we could go to each others #DisneySide party!! I love this Donna! The invitation is so imaginative and the tea cups in #2 are awesome! I would use that for even a non-Alice-themed shower! Beautiful - great ideas! Thanks Rosanne! 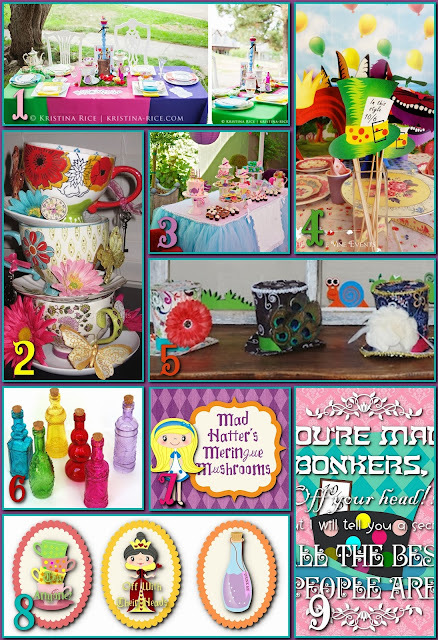 I love the tea cups too, I would love to have them in my craft room. Love your party boards!! That invitation is wonky but perfect! Great, as usual! I'm a little wonky Jenn, so it works. You know "We're all a little mad here..."
That teacup centerpiece is so cute! Great ideas! Thanks Kimberly! I love this party theme!! Thanks Beth! So was the food!! We really need to get together and have a real party some day. I'm looking for bodies for my #DisneySide party on Feb 15th, wanna come down? Thanks PT! I know you are so excited about your new bundle of joy and can't wait for her arrival. This was so much fun, I hope you have enjoyed your virtural baby shower!! Your granddaughter will surely be the luckiest little girl in the world. Just look at these colors!! It is amazing what decoration can do to add excitement to any party. You always do it right Donna! Thanks Didi! I am still holding out hope we can all get together for a Disney Blogger party - I will plan it if we can all figure out a time and place. These are great ideas Donna! I love the big tea cup centerpiece :) What a fun themed baby shower! Really fun theme Hayden! Just wish we could all get together to have a "real" shower - what a great time that would be!! Love the simplicity of using your own tea cups and tilting them! So simple yet so perfect with added bursts of color. Great ideas. Thanks Melissa!! I love doing them!! I am constantly amazed by your many talents Donna! Your invitations always use the most clever language, your party elements will ensure the most colorful event ever, and those hats that YOU MADE are astounding!! If Ashley's baby shower was half as memorable as these photos show, you need to go into the party planning biz- really!!! Thanks :D! I was very pleased with how the hats turned out. I wish I could do this full time - it would be my dream job! !